After eventually finding our way out of Fougeres – that always seems to be the hardest part, finding your way out of big towns or cities – the ride to Mont St Michel was fairly uneventful. The Pedalling Photographer on his way to Mont St Michel! However, at the end of the day, due to it being the height of the holiday season, trying to find a campsite that wasn’t full in this tourist hotspot by the coast proved difficult. Eventually, we struck it lucky at a campsite that was full but we were allowed to camp on a handkerchief-size spot of lawn next to a children’s play area. The only trouble was that there were already half a dozen tents on there anyway! Still, beggars can’t be choosers and it was only for the one night. The following morning we woke to heavy rain. We packed up and then sat in the campsite cafe drinking coffee and waiting for the rain to ease. Unfortunately, we weren’t that lucky, so had to set off fully togged up in our waterproofs. And to add to the rain, the wind was beginning to build up. Little did we know that we were about to catch the tail end of Hurricane Bertha! We battled on, sweating it out in our waterproofs. Eventually, the rain stopped, but by now the wind was gusting strongly and blowing us about on our bikes. It was a head-on wind most of the time, making progress very slow, but at least the sun was shining! We made our way around the Baie du Mont St Michel and came across some land yachts at Hirel making the most of the strong winds and scooting across the sand of the bay. We spent our final evening at the campsite in St Malo, watching the sun set on the horizon before getting up early to catch the ferry back to Poole and home. Categories: Bike, Bike packing, Breton, Brittany, Camping, Cycle camping, Cycle touring, cycling, France, good health, Holiday, Mike McEnnerney, photographer, Photographic, Photography, PhotoLink Images, thepedallingphotographer.com, Tourism, Travel, Vacation | Tags: Bicycle, Bicycle touring, Camping, Cycle Camping, Cycle touring, Cycling, France, Mike McEnnerney, The pedalling photographer, Travel and Tourism | Permalink. Finding our way out of Vitre was straightforward, except that we had a steep descent followed very quickly by a steep climb out of the centre of the town, which is not always that great just after setting off!! 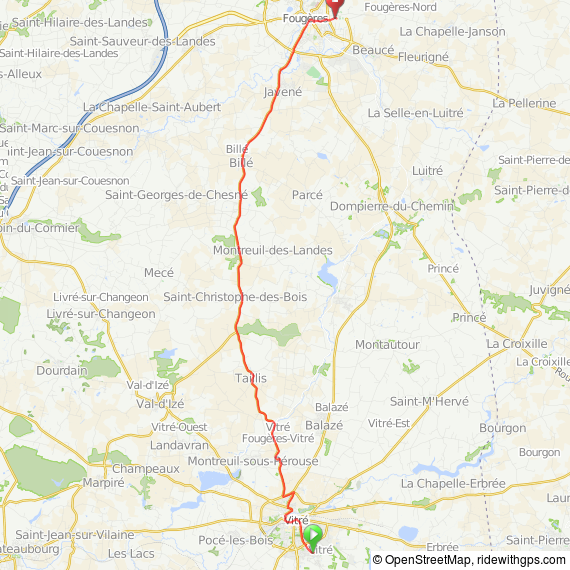 The road to Fougères, the D179, was quite a nice road with very little traffic on it (which is why we like cycling in France), allowing us to get into a good cycling rhythm. Again, not a great mileage, but that’s ok with us! It’s not about the mileage, it’s about the places we visit and the people we meet. Camping Municipal Fougères, on the D17 Route de la Chapelle-Jason, was easily found, just a little south-east of the centre of town. The campsite is well within walking distance of the town centre, should we decide to walk instead of taking the bikes. At the campsite, we met a very friendly Dutch family, also cycle touring. They invited us over to have coffee with them. The parents were both school teachers and were able to take their young teenage children with them on longish cycle tours during the school holidays. The children really seemed to enjoy their cycling and camping! It was great to see a family in harmony together. We stayed an extra day in Fougères so that we could look around the town and check out its most famous monument and attraction, the Château de Fougères, and the Belfry of Fougères. The castle is a most impressive medieval stronghold, beautifully preserved. The castle and its surroundings have been classified as a historic monument. The Belfry of Fougères was the first to be built in Brittany, and is also one of only three belfries in Brittany. It was funded by local merchants and allowed ordinary people access to timekeeping, previously the preserve of the nobility and the church. The location also serves as the centre for the weekend market. The day we walked around Fougères, the weather was rather overcast, and by the end of the day we had torrential rain, forcing us to catch the bus back to the campsite. On 11 July 2013, Fougères hosted the Tour de France as a departure town. The Tour de France is due to return in 2015, for the finish of stage 7, on 10 July. 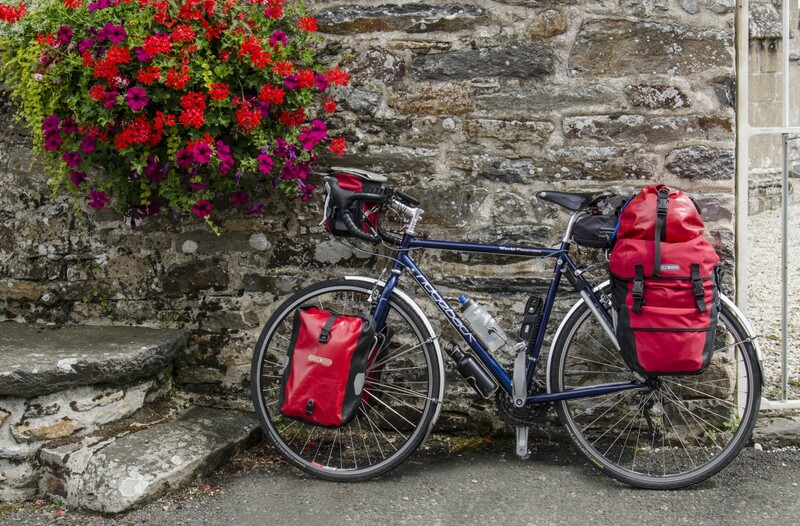 Categories: Autumn, Bike, Bike packing, Breton, Brittany, Camping, Cycle camping, Cycle touring, cycling, France, Holiday, Mike McEnnerney, Photographic, Photography, PhotoLink Images, thepedallingphotographer.com, Tourism, Travel, Vacation | Permalink.